Swans games at the SCG over the next three years. Home » AFL » Swans games at the SCG over the next three years. Sydney AFL boss Andrew Ireland is confident the Swans won't alienate their fans in the west of the city and cede that area to the Giants by shifting their three ANZ Stadium games to the SCG. The Swans last November signed a 30-year agreement with the SCG Trust for the iconic venue to host all of their AFL home games from 2017. On Monday, Sydney announced that they had successfully negotiated with ANZ Stadium management to transfer the three 2016 matches at that venue against Collingwood (round one) Essendon (round seven) and Carlton (round 18) to the SCG. 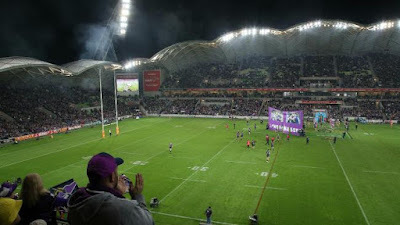 They were the final matches from the home and away season to be played at the western Sydney venue before the contract with ANZ Stadium expired at the end of the 2016 season. However, there could still be at least one more Sydney game at ANZ, as Ireland said the stadium would be used if the Swans hosted a finals match this year. Swans' chief executive and managing director Ireland said negotiations with ANZ Stadium management started last November and got "pretty intense" over the past three weeks. "It (the SCG) is clearly a favourite spot for our members and supporters and we just thought that if we could get it back here a year early it would be great for everyone," Ireland said outside the SCG on Monday. He wasn't concerned shifting games to the SCG would result in the Swans losing members in western Sydney and give the Giants a free run in that area. "The ones (Swans members) out west we know still enjoy coming to the SCG," Ireland said. "All our research shows the crowds that come here (to the SCG) have got a big western influence as well, so we're really confident they will come to the SCG." In a statement ANZ Stadium management said it had "agreed to enter into good faith negotiations with the Swans but only on the basis that ANZ Stadiums valued members and corporate clients would be well catered for." An agreement was subsequently reached where ANZ members could access three Swans games at the SCG over the next three years.